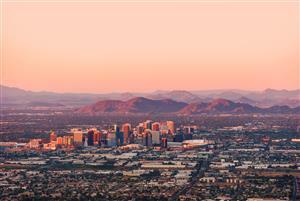 Placed within Maricopa County, Anthem is a part of the larger Phoenix Metropolitan Area. Residents using Anthem property management options can find beautiful homes within this master-planned community. Originally created in 1999 by Del Webb, it is placed within the foothills. While it is only 34 miles away from downtown Phoenix, Anthem enjoys a suburban-like atmosphere. Over the years, it has been named one of the best places to raise a family by Phoenix Magazine and Parenting Magazine. Throughout the year, residents can find a number of different activities. Within the town, residents will find martial arts classes, youth soccer programs, swim lesson and athletic teams. The HOA dues in the community cover the fee for an Olympic-sized swimming pool and water park. Meanwhile, bicycle paths run along many of the main streets. On lunch breaks, enjoy a relaxing walk through one of the pocket parks that dot the town. For athletic games or a picnic, check out the amphitheater and grassy areas at the 63-acre community park. Because of its location at the foot of Gavilan Peak and Daisy Mountain, the town has a cooler temperature than downtown Phoenix. It also has slightly more rain than Phoenix. For shopping options, residents can check out large chains like Walmart, Safeway and Fry's Marketplace. Designer brands can be found at the Outlets at Anthem. To enjoy casual cuisine, residents can check out Two Brothers Kitchen, the Tennessee Grill or Tru Burger Co. The best pizza in the area is found at Gio's Pizza. Meanwhile, Tortas Chano offers the best Southwestern and Mexican food at reasonable prices. To discover delicious Thai, Chinese and Asian cuisine, make sure to stop by the Shanghai Club or Dara Thai.